10. How can you benefit YRN? Showing my interest and my dedication to this clan, helping at organising events. 10b. How will YRN benefit you? Somewhere to chat with nice people and to discuss PB2 related things, hoping that YrN might teach me somethings I don't know yet. 11b. List some experiences you wish to have in YRN: To have fun in the comunity, and to play with advanced players. 12. What YRN Members do you know? Woo, NGL , fish , slashdown, Walian GZ55, lyra, frank, Matt, Irina, Josh and more that I am not able to remember. 13. In your opinion what makes YRN different and/or better from other clans? YrN is a different clan from the others in a way that no other clan might achieve. 15b. How active will you be on Discord, YRN forums, and PB2? Discord: Everyday, Forums regularly, PB2 every 2 days or so. 16. What are your skills within PB2? What is in the servers, except from snipers. 17. Describe what kind of person you are: Funny person, sometimes too funny, you cannot get me offended, I'm an open book to anyone and everyone. 23. Extra comments: Finally got some time to apply here, I just started playing with my old account since PL, don't make me play on sundays. hello Danyel, first i wanna tell you that you're known for your very toxic behaviour. In YrN we all respect eachother and are chill, sometimes we make fun. Seeying you in this clan will maybe result to drama but im just saying you know. It is possible that you changed your behaviour which i rly doubt about that. Lets go on to the app, you said that YrN is a different clan from the others in a way that no other clan might achieve. What do you mean by that, what does YrN achieve and other clans not, elaborate. Apologize for your past sins trashtalking us (forget about my PL team, your application is at stake here), otherwise denying you wouldn't hurt anyone. Do you think you will be accepted into to our clan after these comments? Besides that you went to geno after we denied you. So I ask how have you changed from since these comments were made? Uhm....really its disrespectful to come applying here while making ip threats...badmouth with that dirt around ur lips...so why even bother hmm? 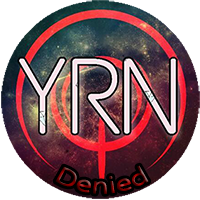 Since last time I've been here the YrN comunity has changed and I also have been told that, YrN is the clan with the best ratio of age and activeness, members being active not only on ranked but even in unapproved matches (which in other clans isn't seen very often). If a player is being rude and actively disrespecting and saying you're cheating but has great skill, it doesn't make up, you cannot enjoy playing with him. But, if a player has almost no skill at all but is respectfull, you'd love chatting with that person, what you often do ingame, but if they have no skill, what reason is to play with them? 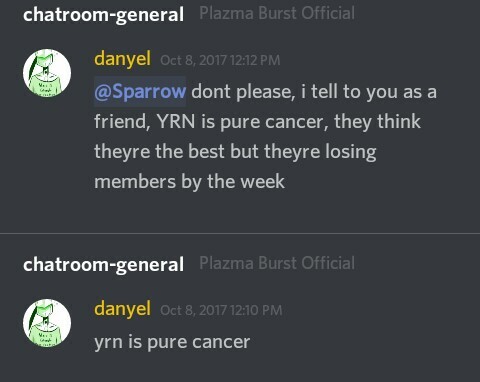 I apologize to the whole YrN comunity, and I swear I have changed since then, but still, I don't like being accused of what I'm totally not (as I got accused by ngl as being someone else). I took actions on my behaviour and I'm a complete different person.I went quickly to apply for GeNo cause school was coming and as I predicted, time wasn't reserved for PC and other stuff. As I have mentioned before, I have changed, time has changed what I have been. Danyel i respect you for replying even though you have had tough times with YRN itself and i believe this actually shows your dedication to join us and if i was to be totally honest i respect that. I have seen the "new" you and you do seem to be less "toxic" as other members have stated Ergo i dont understand why their are bringing up past events. Forgive and forget guys its 2k18 !! Alright, I'll give it a go, hopefully this process will help you get our support. So you went to apply to geno cause school was coming? This doesn't explain why you didn't just reapply. If I'm not wrong, you needed to wait some days before you could re-apply, and since I'm in the pupils councils , I had to start early.